The purpose of the music ministry at FVPC is to lead and engage the congregation in the worship of God through the gift of music. We have several organizations and individuals who assist in this mission—the Chancel Choir, the Women’s Ensemble, the Men’s Ensemble, the Joyful Noise Handbell Choir, the Cherub Choir, and the Junior Choir. All of these groups participate in worship and provide a wonderful atmosphere as we gather together to give praise and honor to God. Our groups work very hard to prepare and present music that enhances and enlivens our worship services. We give thanks to God for the dedicated members of these groups. The Cherub Choir is an enthusiastic group of young people from preschool through 1st grade. They meet to rehearse on Sundays, 9:15 – 9:45 am every week from September through May. The Cherub Choir participates in our 10:00 am worship service—generally once amonth—from September through May. It is always a joy to hear this wonderful group of young singers raise their voices to God. Our Cherub Choir Director is Nina Herdes. The Junior Choir is composed of young voices from 2nd through 4th grade. This group rehearses each week on Sundays from 9:00 – 9:30 am from September through May. The Junior Choir participates in our 10:00 am worship service once a month from September through May. This group of talented singers add so much to our worship services. Our Junior Choir Director is Hannah Paschke. The Chancel Choir is a choral group made up of singers from high school age through mature adults. There is a weekly rehearsal on Wednesdays from 7:00 – 8:30 pm. The Chancel Choir works tirelessly to prepare anthems for our 10:00 am worship service every week from September through the second Sunday in June. Twice a year, in December and in the spring, they present a major music event with orchestra. With the help of many dedicated members and God’s guidance, these presentations are moving and inspiring. Our Music Director and Chancel Choir Director is Ron Kiesewetter. Our Chancel Choir accompanists are John Stombres and Chiayi Lee. 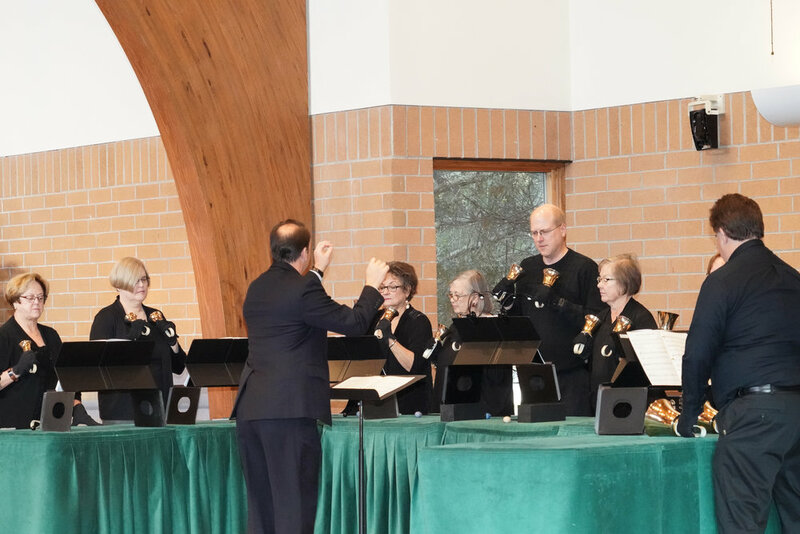 The Joyful Noise Handbell Choir is a group of musicians that meets to play English Handbells. The Choir rehearses weekly on Wednesdays from 6:00-7:00 pm. Our handbell choir is a wonderful addition to worship. The Choir presents music at the 8:30 am and 10:00 am services—generally on the fourth Sunday of the month—from September through June. Our Joyful Noise Handbell Choir Director is Ron Kiesewetter.. The Women’s and Men’s Ensembles rehearse once a month on Saturday morning at 9:00 am. This rehearsal is to prepare for their participation in our 8:00 am worship once a month from September through May. These ensembles are open to anyone in the congregation. It is wonderful to hear the sounds of these voices as they present music to glorify God. Ron Kiesewetter, as Music Director, is the director of the Women’s Ensemble and the Men’s Ensemble. John Stombres and Chiayi Lee are the accompanists for both groups.